“The apple does not fall far from the tree.” So goes the saying. 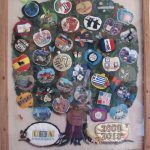 Todmorden U3A Craft Club have produced a tapestry of a tree to celebrate the 10th anniversary of the founding of our U3A. In this case, The Tree of Knowledge. Each “apple” represents a group or amalgam of similar groups and incorporates thirty-five out of the thirty-seven groups existing at the time the project was conceived. Many materials and techniques were employed in the making. Ceramics, textiles, felt-making, macramé, collage, quilting, appliqué, embroidery, beading, tassel-making, paint, and quilling. Each apple took around fifty hours in the making and the planning by the design group took six months. Each group member had a “blind” pick of which group they would create an “apple” for. John Andrae has framed the tapestry in locally reclaimed oak. 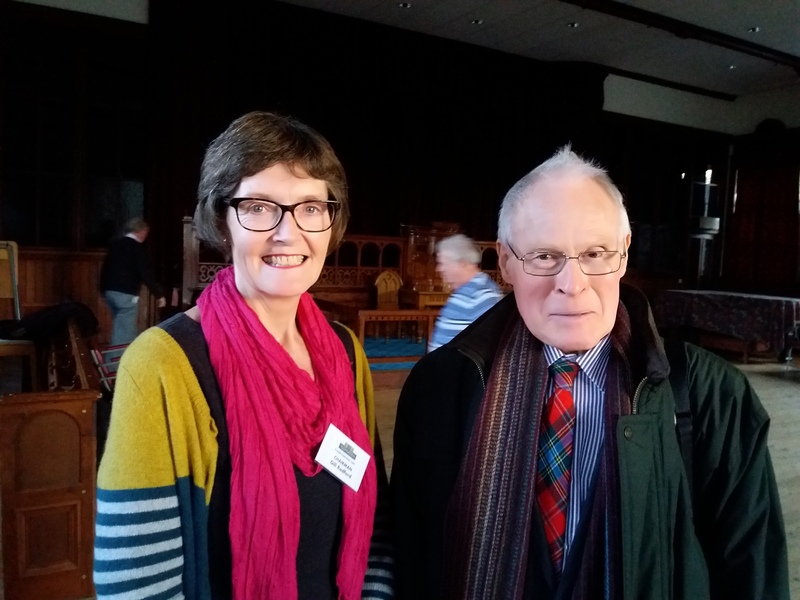 John is son-in-law of the late John McNair, who originally conceived of a U3A Todmorden and was a founder member and driving force in the early days. One member had it on her dining room table for a number of weeks, raised on tins of baked beans and she had to devise ways of keeping the cat out. 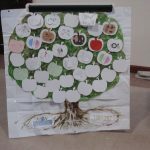 The group were constrained by the apple shape and overall size – 4’ x 3’ 6”. It needed trial and error in terms of design and which materials would achieve the concept for each apple. Much of the work was done outside of the group meetings so it didn’t take over the group activities. Many biscuits were consumed. Almost all of cost was borne by the group. The plan is to display the tapestry at the April General Meeting. At the time of writing a permanent home for the tapestry is still being sought. 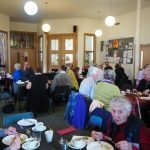 Central Methodists Todmorden was the venue for the third Tod U3A Convenors’ Lunch. The purpose of these is two fold: as an expression of thanks from the Committee for all the hard work the convenors do to keep Tod U3A going. Secondly, it is an opportunity to keep convenors up-to-date with anything they need to know. So before the convenors helped themselves to the buffet lunch provided by Catrina and Andrew at Drop Farm, Oxenhope, Gill Radford welcomed everybody and thanked them for all they are doing. She then recited three questions we would be asked to answer in small groups. More of which later. Nigel Plant kicked off business matters with a few details regarding Beacon, the new IT system designed to make internet use simpler when using for anything to do with Tod U3A. Convenors had had training from Nigel but little bits and bobs came up as the training went on and he wanted to ensure that those in the earlier sessions had the opportunity to be apprised of anything they may have missed. Our treasurer, Emily Watnik was next up, now able to keep track of our finances in a more sophisticated way using Beacon, and asked convenors to get an invoice when paying venues directly. Fiona Ryland broached the subject of accessibility to our classes and invited convenors to contact her if they had any queries or problems. I’m assuming her email address is accessibility@u3atod.org.uk I will update if necessary. Ernie Rogan advised that he has reorganised the rota for refreshments served at general meetings. Each group will take it in turns, starting alphabetically, to have two of its members staff the refreshment point. As there are so many groups, Ernie said, each with a number of members, it would mean that each individual member is likely to do it only once in ten years. That’ll be a lifetime for most of us, so grab your chance when it comes. What in your experience makes a group successful? What niggles do you have about convening a group? What help would you appreciate, if anything? Which ideas will you try to put into practise with your group? Our table had an interesting discussion and each table fed back at the end leaving the committee with some useful points to mull over. The photography group have some of their work displayed at Tod Information Centre throughout April. You will enjoy a variety of subjects: the expected, but not to say ordinary. Landscapes, wildlife – the birds and the bees, well, wasps actually, as well as the unexpected, unusual and imaginative. Do go along. Your correspondent has and gives his recommendation. 21st March, 2019 will be remembered as the time Todmorden U3A was hit once again by the benign storytelling tornado that is Maria Glot, historical raconteur extraordinaire. Her primary subject was what happened to Saltaire and Salt’s Mill after the death of Titus Snr; her secondary subject – or parallel plotline – was the ‘The Curse of Milner Field’, a story intricately linked with the fates of several owners and managers of Salt’s Mill. Titus Salt Jnr built himself a magnificent Xanadu of a mansion in Shipley Glen in 1869 which he called Milner Field after the manor house he had demolished. But he died young of a heart attack in 1887. Shortly after, a downturn in the wool trade resulted in a near collapse of the business which passed eventually into the ownership of James Roberts who made a killing on uniforms for the army in the Boer War and again in 1917 when he sold redundant blue-grey serge to the newly-formed Royal Flying Corps. But moving into Milner Field did Roberts no good: three sons all died young, the remaining one was badly injured during World War One, and his daughter’s lover was shot by her jealous husband. Roberts sold the mill to Edward Gates whose wife died a few weeks after they moved into Milner Field. Gates himself died from blood poisoning following an injury to a big toe. At this point, the house became unsellable, and Salt’s Mill’s next owner, Sir Henry Whitehead, chose to live in Harrogate. The house fell into disrepair, survived dynamiting and was finally demolished. Today it lies in ruins. And is haunted – Maria told us with great authority! – by a thwarted 18th century lover, who cursed the house and then hanged herself. Salt’s Mill itself survived until 1986 when it closed because large lorries could not access it. It was bought by Jonathan Silver in 1987 and redeveloped into a technology, business and retail hub, the David Hockney 1853 gallery, a museum, and dining venue. Peter Carrigan, Vice Chair of U3A Todmorden and Speaker Finder, with Maria Glot. Photo by Roger Howard. Maria has been involved with Salt’s Mill and Saltaire for many years and is proud to have been part of the team that achieved World Heritage Status for Saltaire in 2001. Her deep love for the place and its people is evident in her talks, and we have been privileged to listen to her twice. The Art Club have been busy, as Jean Pearson explains below. We have been inspired by poetry for our current project and some beautiful artwork has been produced. We have been inspired by poems such as ‘Daffodils’, ‘Matchstick Men’, ‘Wild Geese’, ‘Ode to Autumn’, ‘Ducks’, ‘Robins Round’, ‘The Curious Hare’, ‘The Birch Tree’, ‘The Scarecrow’, ‘The Englishwoman’, ‘On a fly drinking out of his cup’, ‘9 Circles of Hell’, ‘Billy Goat Gruff’, ‘Anne Hathaway’ and ‘A Shropshire Lad’. 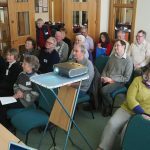 At our next meeting at the Fielden Centre, Todmorden from 11 am -1 pm on Tuesday, 26th February, 2019, we will be discussing our individual choices and sharing our techniques and ideas. There are just a few places available if you would like to have a taste of what we do – every fortnight. Every session at Art Club is very special to all of us!!! I haven’t taken any photographs of our work but I have scanned my painting – watercolours – entitled ‘The Englishwoman’ by Stevie Smith. ‘This Englishwoman is very refined; She has a flat chest and a flat behind.’ I’ve written a second verse! ‘These Englishwomen are not refined; Each has a buxom bosom and a big behind!’. So I’ve drawn a matchstick woman and some Beryl Cook women. Hope it gives you a chuckle. These walks are the brainchild of group member Alan McDonald, who is studying for an MA in Philosophy at the University of Manchester and is also a member of Tod Walkers, who don’t usually lead or organise walks directly, but made an exception for philosophical walks as part of the Festival of Ideas. For each of the first two, Alan successfully inveigled a proper philosopher from the Uni to join us and put us through our paces with a set topic to discuss on the way. The first took place on the 21 June, the evening of the solstice, a deliberate choice on the part of Alan. The conversations centred on the philosophy of walking and what it means to do things together. We started at the Unitarian Church, went uphill to Longfield Equestrian Centre and Long Hey Lane, then left along the Calderdale Way, returning down through the woods and on to Oldroyd Road to the canal towpath, finishing in The Pub in Brook Street in Tod town centre to continue discussions there. During this walk we were invited to reflect on the good life and the role of nature in our well-being. Our walk through the landscape prompted reflection; landscapes such as the South Pennines are increasingly the focus of policy demands to deliver public goods – contributions to societal well-being – in return for the public subsidies received by land managers. In addition to food from livestock farming, natural landscapes will be expected to deliver improved flood mitigation, carbon sequestration, biodiversity and opportunities for recreation. Underpinning this policy shift is the assumption that changes to the way natural landscapes are managed can benefit people – improve their lives – in a range of ways. This will change both the way the landscape looks, and how we relate to it. As we walked through the landscape, we were invited to think about the variety of ways our environment contributes to our well-being, and in doing so engage with that most ancient of philosophical questions: what is it to live a good life? The linear walk began at the entrance to the Top Brink car park on Lumbutts Road at 10:30 a.m. We strolled along the ridge and descended eventually to the canal towpath and ended with more philosophical chat in the pub called The Pub (3 Brook St, Tod, OL14 5AJ). The next walk will be on the equinox, Friday 21 December, this time a walk along the canal from Hebden Bridge, again finishing in The Pub. On such a lovely day I’m delighted to announce I have some good news. 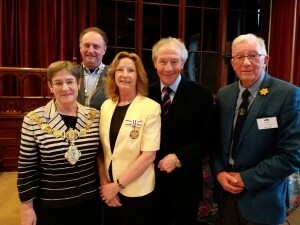 Last month I encouraged you to consider volunteering to help U3A Todmorden in one way or another, play to your strengths, think about what you enjoy or at the very least, be prepared to admit that there might be a role you could take on to help make sure U3A Tod can continue functioning hopefully towards our 20th anniversary. 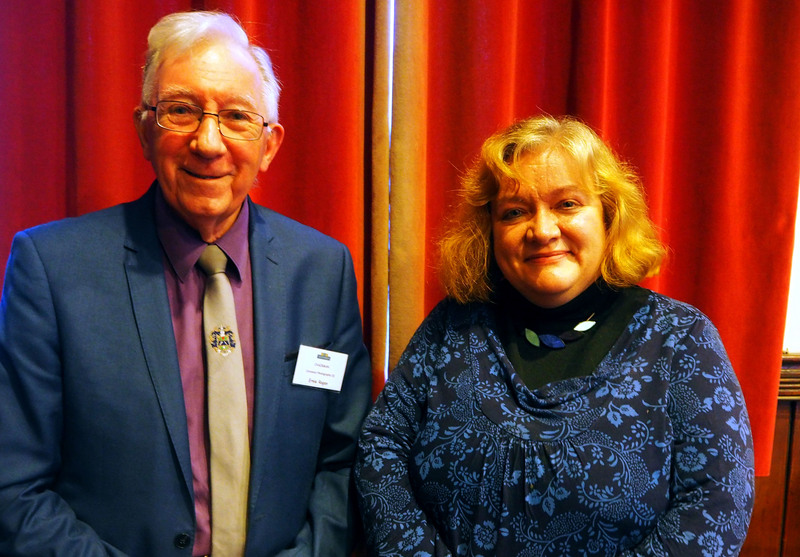 I can tell you now that our current Speaker Finder Peter Carrigan has volunteered to take on the role of Vice Chair. 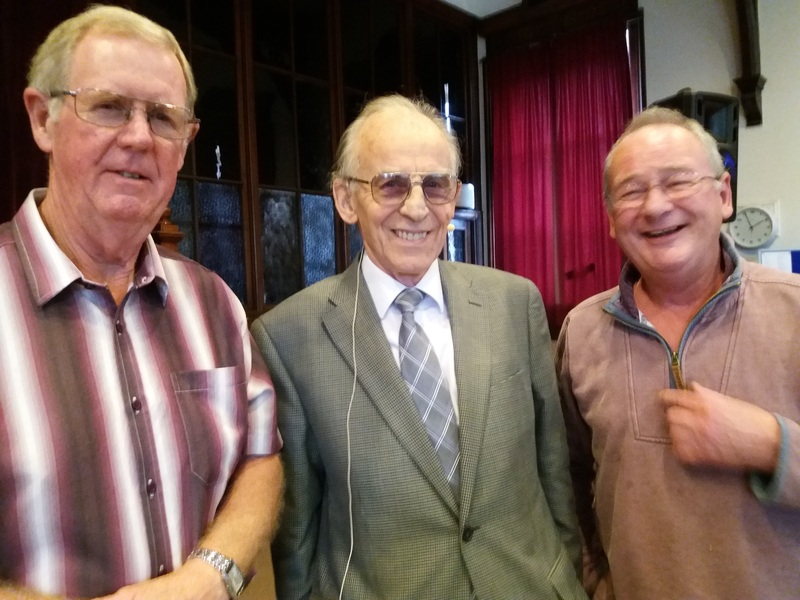 I believe the correct terminology is that I give notice to our members that Peter Carrigan will become Vice Chairman of U3A Todmorden and the process states that at the beginning of the November’s Monthly Meeting we will hold a short EGM to confirm his appointment. Thank you so much Peter this hopefully means, that I am no longer at risk of becoming the last ever Chair of U3A Tod! I do say hopefully because generally speaking the Vice Chair does metamorphose into the Chair…. But not always. My fingers are most definitely crossed that Peter enjoys the experience and will be standing here, in my shoes in 2 years time. This would mean of course that we need a new Speaker finder to replace Peter, and consequently there is a need to quickly appoint a shadow Speaker Finder to learn the ropes. Indeed we are looking for a few people to shadow the committee and learn how we operate. We will need a potential Treasurer to shadow and replace Emily Watnick, an Assistant Membership Secretary to support Brenda Botten. 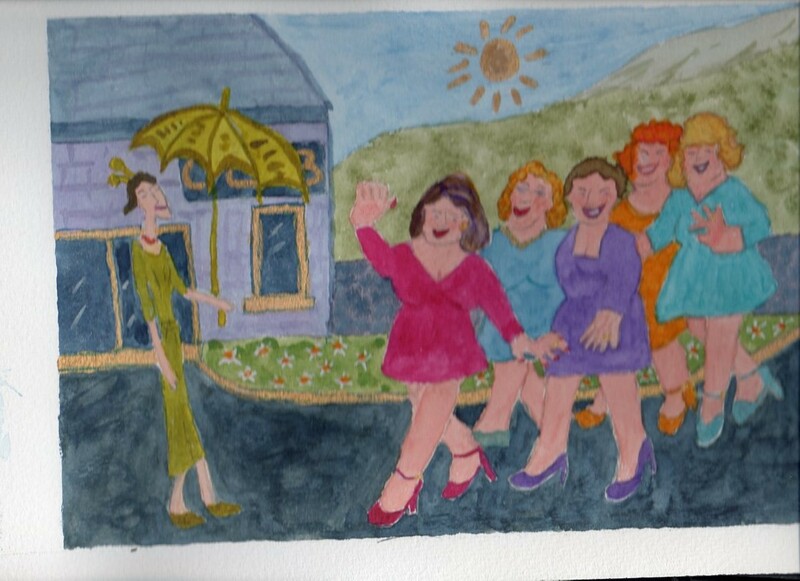 I’m toying with the idea of setting up a Special Events group – certainly we need a sub- committee to spend time organising 2019 Christmas’ meeting, maybe a Christmas lunch at a venue large enough to invite more members than the Lunch Club does at the moment, a Convenors lunch, maybe a coffee morning for new members too at some point. I’d also like to encourage a small team of people to help welcome new members and introduce them to those with similar interests. Certainly we can be a daunting lot when you’re the new face looking for some friendly ones and the membership secretary, with the best will in the world has to busy herself explaining the documents to be filled in to another potential new member. You will have noticed that Ernie has taken on the job of Refreshments co-ordinator and would like members to indicate which month they are available to set up serve and clear away the tea and coffees. Please do not leave this afternoon without having a word with him. Certainly we need to tap into our membership to find the next generation of committee members and group leaders. So please, come on down! 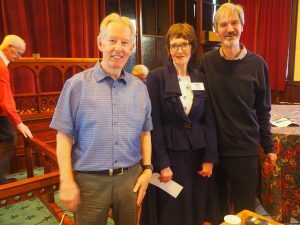 Groups Co-ordinator Gail Allaby reports that both the proposed Shakespeare Group and Creative Writing Group 2 will hopefully start in the New Year, when she has managed to secure replacement convenors. In addition members need to know that The Old English Group is now full. The last task before welcoming Robert Cockcroft was to announce the winner of the Anniversary Survey. Susan Cockcroft drew John White’s name from the hat and he was presented with a box of Heroes. In John’s words, he can no longer say he never wins anything! Robert Cockcroft , the speaker this afternoon, gave his talk, ’What’s wrong with rhetoric’. This proved to be a most enlightening discussion about the persuasive art of discourse with examples from politicians and philanthropists both historical and modern. It was especially interesting to see the presentation and defence of argument in the letters between Robert’s grandparents during their courtship when it was certainly not apparent that their forthcoming marriage would actually take place! I quickly discovered that my own understanding of rhetoric was pretty much limited to the concept of a rhetorical question and will be making time to have a look at Robert and Susan’s book,’ Persuading people, an introduction to rhetoric’. Please look out for the U3A report written by Ant Peter in the local press and on this website. Members meeting 19 April 2018. A sweltering day and the committee expected a smaller than usual attendance. However 132 members and visitors gave up gardening duties to attend. Of these 103 paid their subscriptions by cash or cheque and another 27 paid by post or internet banking. We also had 5 new members, so welcome to them. This means we now have almost 25% of subscriptions already paid. Thanks to all members who have paid to date. On 1 May 2018 subscriptions paid by standing order will be due, and this puts U3A Todmorden in a very healthy financial position. It benefits all members for subscriptions to be paid on time; reminders cost time and money. 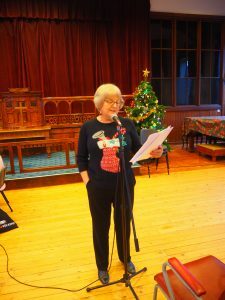 Gail, our Groups Coordinator had a hospital appointment, so her report was given by Gill Radford, our Vice Chair, who told us that there are 5 more groups about to be formed; details can found shortly on the website. 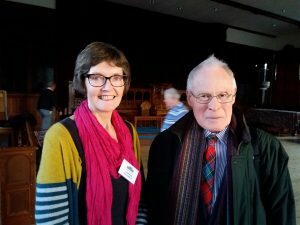 Gill also gave us a progress report about the Banner being produced for our 10th Anniversary, and reminded convenors to contact Mary Findon, with their ideas. We now have 524 members and are, by far, the largest in our “cluster” group of neighbouring U3A’s. We have a vacancy for Vice Chair !! Who wants to join ?? Sue Nightingale showcased the Opera Appreciation Group. Her love of this art form was obvious to all. 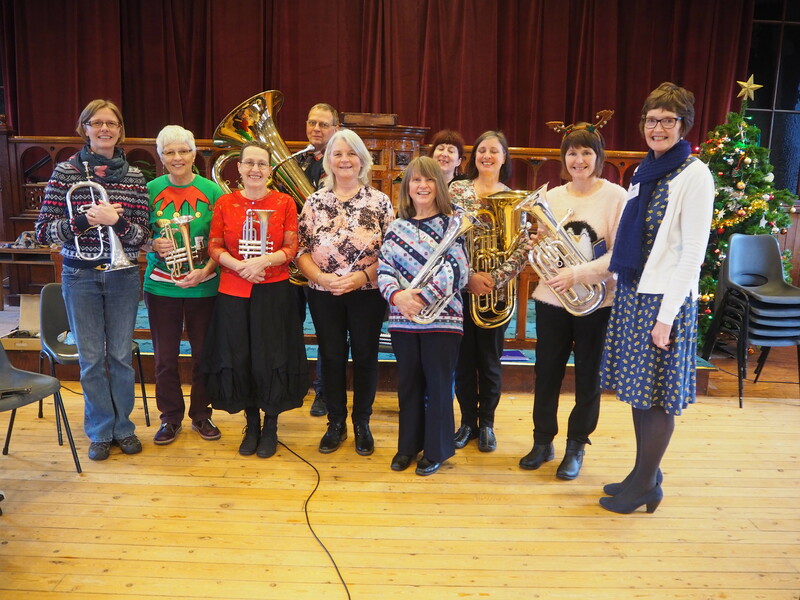 Full details of the group can be found on the website. Peter Gibson originally suggested that we showcase groups, and he has undertaken the bookings and administration. He has now handed that responsibility to me. I will be writing shortly to all convenors asking if they wished to make booking, and giving contact details. You will hear shortly about an EU directive; GDPR; which is a sort of update for Privacy and Data Protection. The committee have worked hard to ensure we will meet the criteria required and last week agreed a policy we will adopt. This will be published on our website prior to 25 May, the date the directive takes effect. All members will be informed by email, or post for those who do not have web facilities. 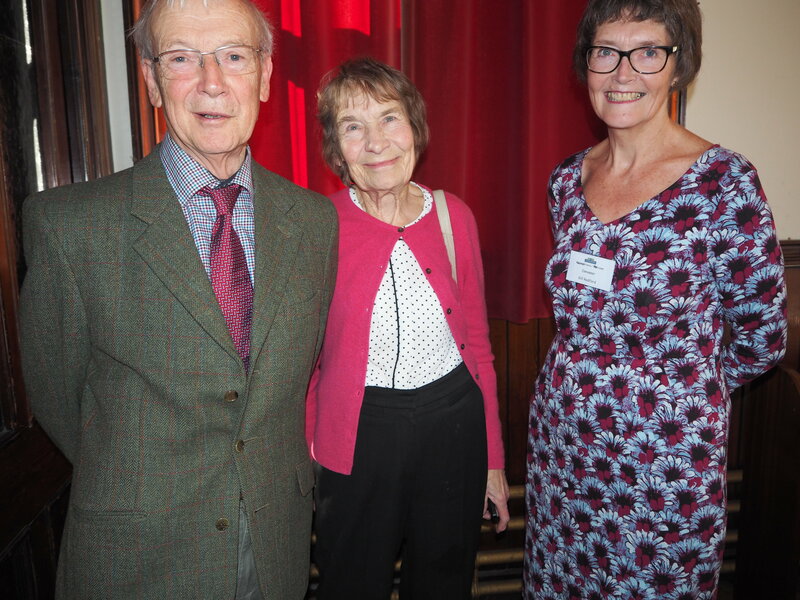 Our guest speaker, making a welcome return was Granville Dobson. This time he turned his attention to his 15 years as a Magistrate. While his presentation was, in the main humorous, he spoke about the serious decisions which have to be taken. Magistrates are drawn from all aspects of society and must represent the population. All Court cases start initially at Magistrates Court, before, perhaps, moving on to Criminal Court. There were, at one time, 300 Magistrates in the Bradford Courts, all unpaid. 97% of all cases are dealt with by Magistrates. There are usually 3 sitting together so a decision can be reached. Granville gave an instance of an accused being rude to the Bench, was told he was in Contempt of Court, and every further outburst would result in an additional month’s sentence being applied. Asked several times if he understood, the accused eventually replied that he had been told, by Granville, not to speak again !! 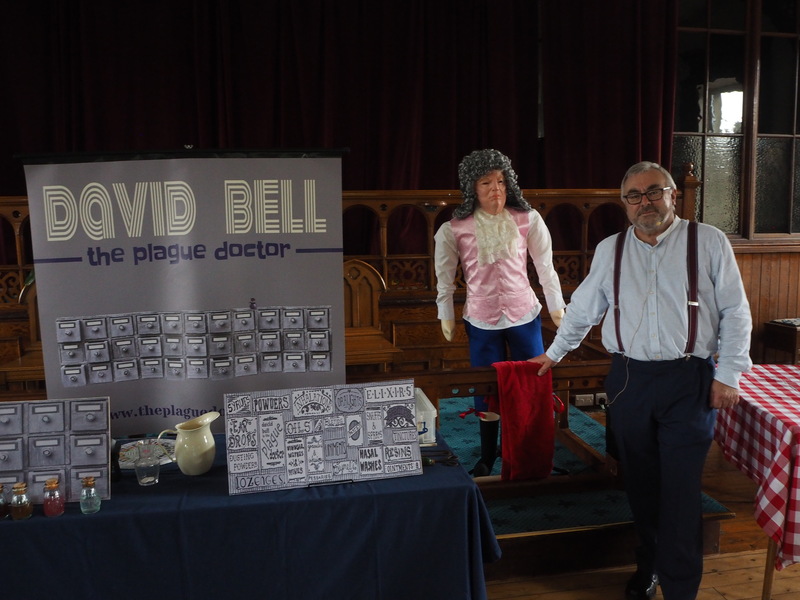 We hope Granville can return for another talk. Our next meeting will be Thursday 17 May, our 10th Anniversary meeting, commencing at 2:00pm. It will be an enjoyable afternoon, with probably some cake, a quiz, a humorous questionnaire and entertainment from various groups. Your committee look forward to seeing you. Greetings to all members. Another full house. It is very heartening for the committee, our Speaker Finder Peter Carrigan, and our speakers to see so many members attending. Our guests were Mrs Kate Moreton-Deakin, one of the Deputy Lord Lieutenants of West Yorkshire; Cllr Jane Scullion, Deputy Mayor of Calderdale and her Consort Andrew Bibby. All said they had enjoyed their afternoon. Membership has risen to 519 at the last count. At next month’s members meeting, we will be pleased to commence taking subscriptions for the next financial year: these remain at £15. There will be some changes to procedure for new members, to try and reduce issues with banks. The committee will also be asking members to sign up for Gift Aid. If members pay tax then they can sign for Gift Aid. By completing one form, just once, U3A Todmorden can claim back money from HM Government. In the last 2 years we have reclaimed almost £900. More members joining the scheme will help to keep subscriptions to the present level. I will be writing to members with full details in about 2 weeks. A small sub group are looking at a combined finance and membership system, being supported by the Third Age Trust. This system should help to make our administration easier; there will be small annual cost of 50p/member, which will be absorbed. Peter Gibson and Nigel Plant have been researching a replacement digital projector, wide screen and stand. Our original equipment is almost 10 years old and does not interface with modern computers, without adaptors. The Creative Writing group have prepared, to date, 7 pieces some of which, we hope, will be performed at our Anniversary meeting in May. Some are quite hilarious. Last month, my appeal for volunteers to join the committee, seemed to have been missed by members. So I repeat, we have committee members who are nearing the end of their tenure and have/wish to be replaced. Please contact me or any committee member, if you can offer your expertise. 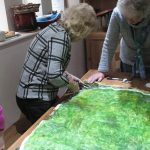 Our showcase group this month was Practical Art. 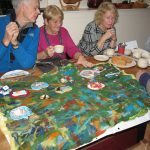 Pam Ball gave details about the group and the materials used – “charcoal, very messy.” She then introduced some colourful images of actual projects produced by members, demonstrating the variety and standard of the items . The photographs were impressive and the presentation was accompanied by John Denver’s “ Sunshine on my shoulder.” I would like to offer my congratulations to all concerned. 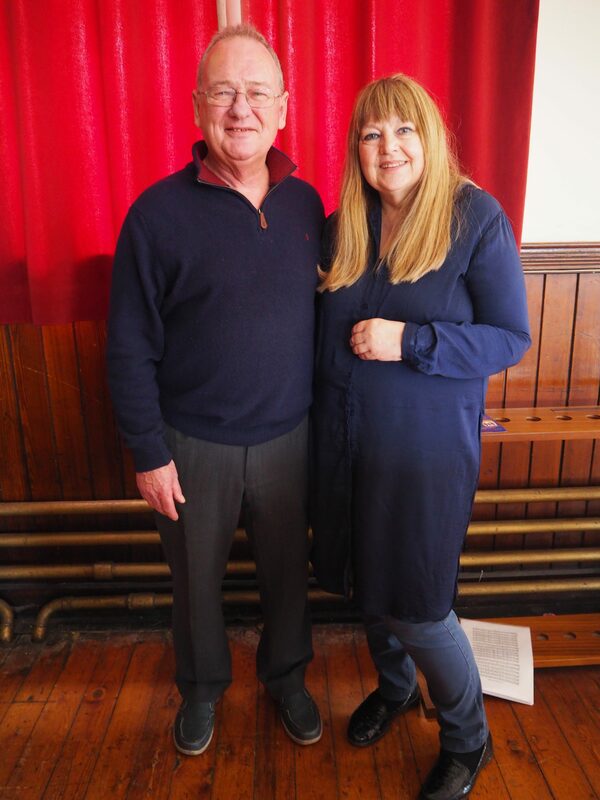 Geoff Carter, our guest speaker, returned for a 4th visit, with a presentation about the Battle of the Somme. As usual, he had researched his subject in great detail. Geoff began by telling members how volunteers were encouraged to sign up for the Forces: to “Fight for King and Country”. 500,000 joined in about 3 weeks and overwhelmed the system. He described a usual soldiers day: Stand to; morning hate (firing in the direction of the enemy); breakfast (no firing during meal breaks); relaxing time and hot meal; evening stand to; and evening hate. At night trenches would be dug, supplies brought up, and intelligence gathered by patrols. The details of the casualties were appalling. On 1 July 2016 the British Army were ready to commence battle. 57470 were killed or injured on the first day. Over 2 thousand officers were killed, and nearly all the Captains, who were first “over the wall” armed with just a revolver and stick. This was and is the greatest loss of men ever suffered by the British Army. The Somme campaign continued for 4 ½ months, after which a total over 1 million men, on all sides had been killed or wounded. Geoff gave his assessment of the reasons for the failure of the battle plan, and the history of the leaders of the British Army. An excellent and sombre presentation appreciated by our members. Our next members meeting will be Thursday 19 April, when our speaker Granville Dobson will be making a return visit to talk about his “15 years as a Magistrate.” Your committee hope to meet you then. 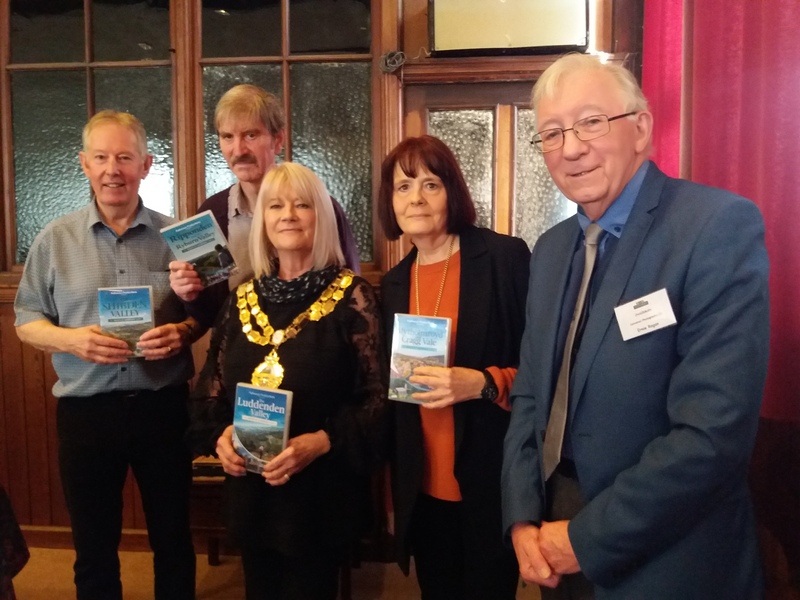 On Thursday, 18th January, U3A Todmorden’s monthly meeting’s guest speaker was Dr Emma Stafford, a Senior Lecturer in Classics at Leeds University and author of the guidebook to Todmorden Town Hall. Her subject was the Greek goddess, Nemesis. But what did – and does – Nemesis stand for? Nemesis certainly still inhabits our imaginations: in Germany, their national football team is regarded as England’s ‘alten Nemesis’, and in France, Sir Alex Ferguson has been described as Arsène Wenger’s ‘éternel Némésis mancunien’. But why should someone come to get you? The ancient Greeks associated Nemesis with ‘hubris’ or the excessive pride that leads mortals to get above themselves, and the goddess was there to keep you in your place. At first, she was envisaged wearing white because she was pure and justifiably indignant at mortal behaviour. And, being pure and blameless, she was considered qualified to represent justice, so her images came to show her with a set of scales. In her developing role as the goddess who urges us to think before we act, she comes also to be given a rudder and a wheel, symbols telling us to ‘keep on track’. And if we fail to heed her, then, as one statue shows, she will trample on our heads and set her bird of vengeance, a griffin, on us. This was a learned and enlightening talk, giving us an insight not only into Nemesis, but also into the world of academic research and its relevance to our own lives. Our January showcase speaker was Myrna Beet, convenor of the Quiz Group. Meeting on the 4th Thursday of the month, they work in random teams to do a 60 question quiz set by a member. Members also take it in turns to provide the refreshments. It must be fun, as several members have been going for years! 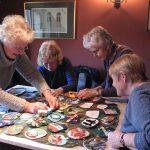 U3A Todmorden’s next meeting will be on Thursday, February 15th 2018, and our speakers will be Peter Thornton and Ray Riches with their talk ‘The Pathways Story’. Our contact details are www.u3atod.org.uk (website), enquiries@u3atod.org.uk (email), or 01706 812015 (phone). 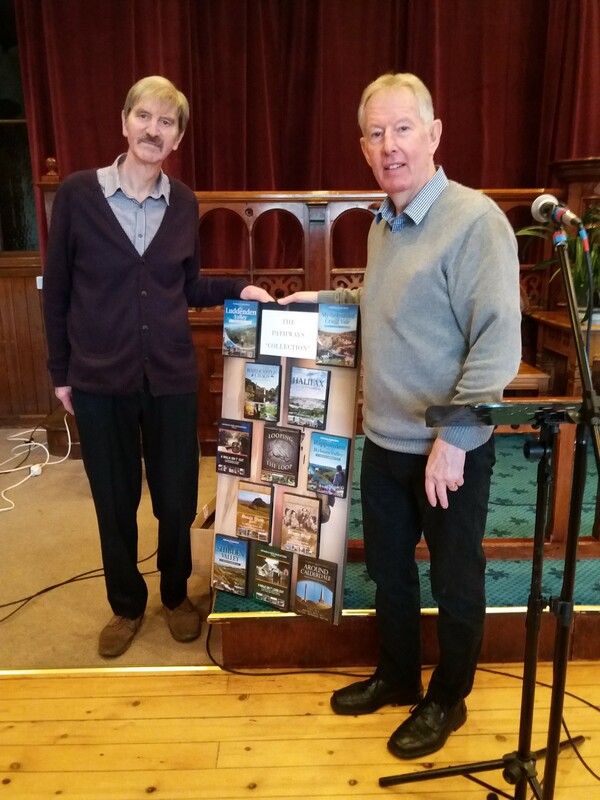 On Thursday 21st September U3A Todmorden were lucky to secure the services of Trevor Moody, a National Trust volunteer speaker, to tell us about Gibson Mill and Hardcastle Crags. Trevor gave us a talk that entertainingly embraced etymology, social history, geology, engineering, manufacturing, holidaying, photography and composting toilets. Trevor often amusingly intertwined fact and anecdote. Thus the fact that the Norman Wyomarus de Greenwode was the first landowner of Greenwood Lee in Hardcastle Crags was enlivened by the story of the drunken auction in 1764 that transferred ownership to the Gibson family. Or the fact that the navvies who built the Walshaw Dean reservoirs were housed in wooden huts is memorable because the settlement became known as Dawson City, a reflection of the energy and lawlessness of the Yukon Gold Rush town. But much of the talk concentrated on the Gibson family and their development of the land round their mill. Cotton manufacture required a weir, a millpond, the mill (opened by the second Abraham Gibson in 1800), and a 72 hours-a-week workforce (in 1833). It also required transport and Trevor’s display of old photographs of the different specialized carts for wood or stone used in the Hebden area was exceptional. The fever van was a specialised item too. By 1899 the mill was closed. The area then became an immensely popular recreation centre, the brainchild of Ernest Greenwood. There were cafes and dance halls, swing boats, boating ponds, camping and holiday chalets. In 1946 these holiday enterprises closed and in 1951 Lord Savile gifted 250 acres at Hardcastle Crags to the National Trust to prevent the building of another reservoir. From 1984-2006 the Trust renovated the property, garnering occasional windfalls from films such as ‘Nicholas Nickleby’ and ‘Death Comes to Pemberley’. And, of course, the Trust now carries on the fine tradition of providing recreational facilities for those who want fresh air and fine countryside. Trevor is very much to be thanked for reminding us of this wonderful facility on our doorstep. 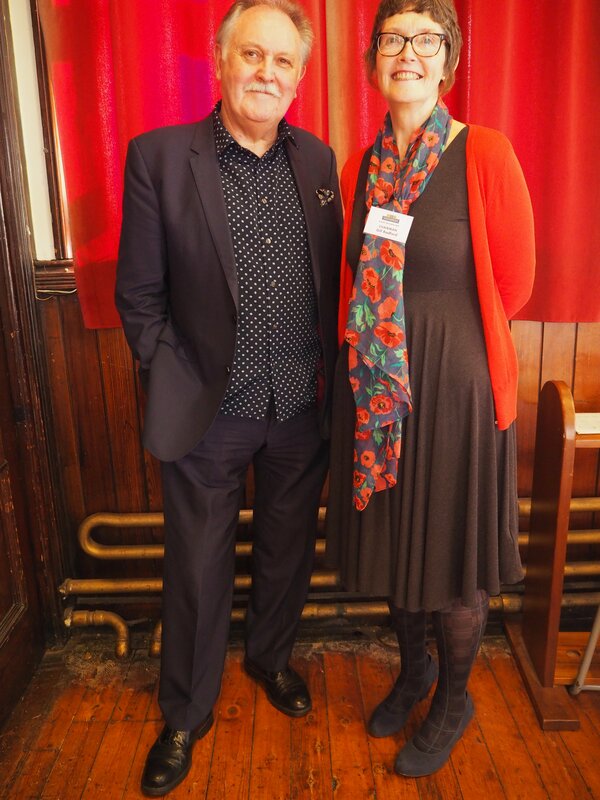 Our showcase speaker this month was Anthony Peter who convenes the ‘Novel Appreciation’ group. This good-humoured group tackles novels that have some depth and serious purpose, considering whether or not they can be judged as good literature. 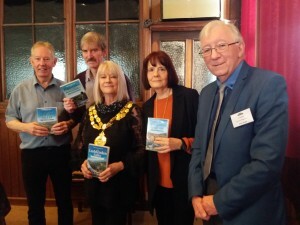 Calderdale Library Services provide most of the books and a meeting room for free, so the group annually buys a set of a novel they don’t have by way of thanking them. An excellent hanging made by the Craft Group for Walkers Are Welcome has been on display in Todmorden Library recently. A fine piece of work for the community by the community. Congratulations to everyone who contributed. 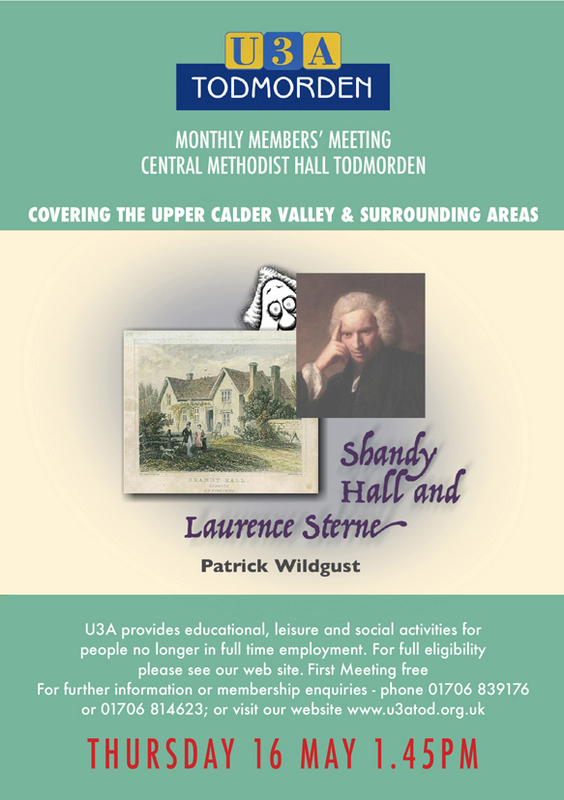 U3A Todmorden’s next meeting will be held on Thursday, 19th October in the Central Methodist Hall in Todmorden at 1.45. The meeting is an unusual one: Sheila Antrobus, local antiques expert, will be giving a short talk titled ‘Don’t Chuck It, Check It’, accompanied by a brief evaluation of objects brought by our members. This meeting has very particular arrangements which must be adhered to; details are available on our website under News / September’s Monthly Meeting. Please check them rather than turn up and be disappointed. May and June have been musical months for U3A Todmorden. 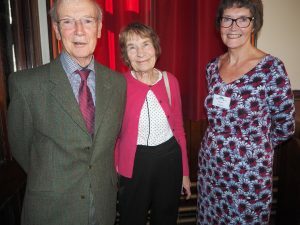 In May, members enjoyed the return of Bernard Lockett whose talk focused on the political and social satire of Gilbert and Sullivan. It’s hard to imagine Gilbert and Sullivan as anything other than pillars of the establishment, but Bernard Lockett showed us that their brilliance lies in the way the bite of Gilbert’s satire gains acceptability through the softening effect of Sullivan’s music. Nevertheless, Bernard proposed that since G&S performances were attended by all classes of society, one can imagine the lower classes in the gallery enjoying a laugh at the expense of the socially elevated in the stalls. Such laughter would, for example, have come at the expense of Parliament (‘Iolanthe’), the Law (‘Trial by Jury’) or corruption in government (‘The Mikado’). Gilbert’s social commentary is often acute. ‘Princess Ida’ advocates the role of women in society to clear up the mess that men – who ‘at best are but a monkey shaved’ – have made of it. It makes the case for university education and votes for women. And in ‘Utopia Limited’, one critic has observed that ‘English prudery, English conversation, English company promoting, the English party system, the English War Office and Admiralty, the County Council, and the English Cabinet’ are all taken to task. 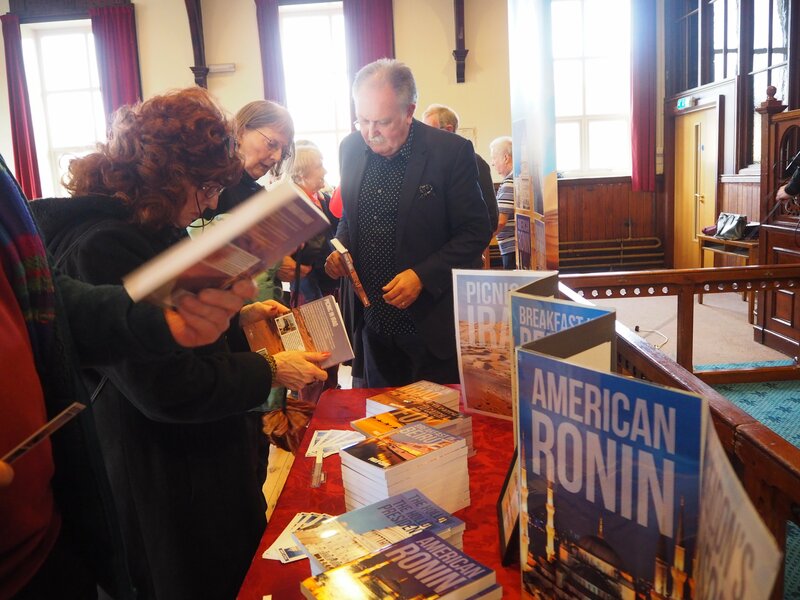 Once again, Bernard’s talk was illustrated with DVD excerpts from the operas which were highly entertaining and reminded us that although the operas are considered ‘light’, they offer substantial challenges to the singers. Neil Smith in June, by contrast, offered us musical entertainment of a delightfully different and varied kind. Neil’s reputation as an international guitarist is among the highest, and together with his skill and musicality in styles ranging through classical, rock and jazz, he has clearly enjoyed a rich, rewarding and, occasionally, bizarre life. These unusual experiences include being Molotov-cocktailed in Belfast, a performance for Blair and Clinton that was interrupted several times by an argument among their aides, avoiding a honey trap in a Moscow hotel, being bodyguarded by a Greek national hero, ‘Tassos’, and just missing the chance to go to Hamburg as a fill-in guitarist for The Beatles. Neil has played for people such as Elizabeth Taylor, The Queen Mother, the Red Army in Transylvania, and General Sheikh Mahtoum III. His performances around the world at embassies are innumerable and include an encounter with an embassy 007 who quizzed him on the USSR and Arabia. Alan’s knowledge and expertise are prodigious, and his group’s main focus is on the history of 20th century northern textile towns. They make use of autobiographies and Mass Observation documents. They have a current ambition to study Todmorden local papers from 1918 as a turning point in the town’s manufacturing life. Nigel is an experienced photographer with 20 years’ experience of clubs at national and international level. Sometimes the group runs sessions on camera technique (filters, tripods, range, shutter speed etc. ), but generally bases sessions on looking at members’ photographs. They also mount their own occasional exhibitions in the Information Centre, and organise outings. The AGM takes place at the next meeting on 20th July. Members are reminded again that subs should be paid as soon as possible, with Gift Aid if possible. Convenors are reminded to check that those attending their meetings are paid up members. Peter Gibson, our long-serving and much-valued Technical Officer, wishes to relinquish some of his responsibilities. Anyone with a technical or practical bent who is willing to help take over some of what Peter has been doing, should contact Peter directly. Todmorden U3A’s next meeting will be held on Thursday, 20th July in the Central Methodist Church in Todmorden at 1.45. This meeting will our AGM, followed by a talk by Geoff Tansey titled ‘Food: Wars or Peace? Challenges and Opportunities in 21st Century’. Our contact details are (website) www.u3atod.org.uk, (email) enquiries@u3atod.org.uk, or (phone) 01706 812015.